Bush camping at Fitzgerald Bay. Camp fire tales, being outdoors and reconnecting with loved ones and nature. The call of the open road on to the next adventure. Catching a meal of fresh fish or making a new friend when dining at the friendly local are at the heart of the Aussie camper and wanderer. Fish the nature rich Spencer Gulf waters and rekindle relationships while making new ones along the way. Unearth Whyalla landscapes and natural wonders during your adventure. Motorhome parking is available at both the Discovery Holiday Park and the Whyalla Caravan Park where dump points are available. Motorhome overnight parking is available at Stuart Park. 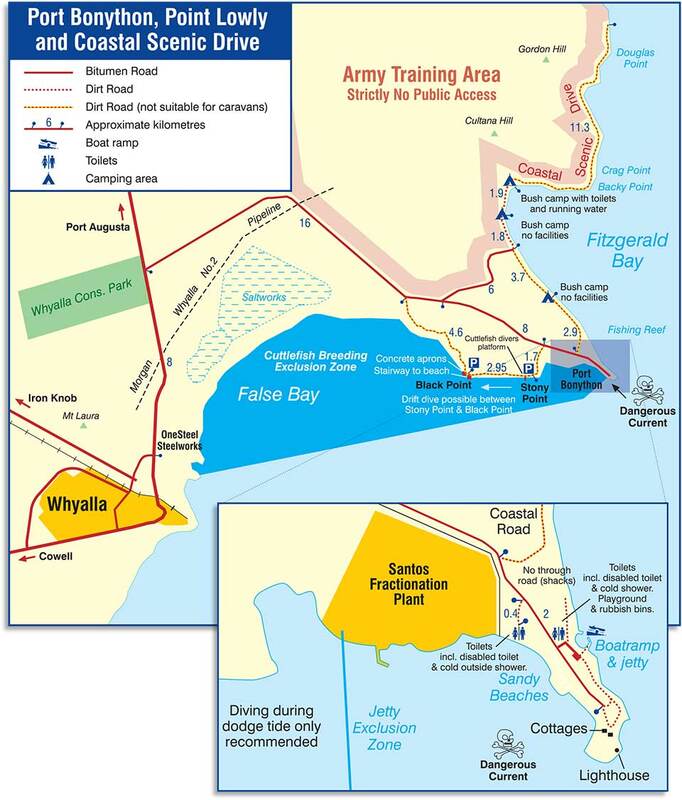 Other Dump Points are located at Southern Information Bay, Lincoln Highway, Jubilee Park, Whyalla Showground and Point Lowly, just past the Santos LPG plant.